More coding camps and Maker Faires aren't going to solve the diversity problem in science, technology, engineering, and mathematics (STEM). We don't simply need more, we need different. We need to change our game and design solutions that are girl-centric and culturally-responsive and, most importantly, supportive of girls who are far outside the STEM winners' circle. We need to be intentional every step of the way to recruit, retain, and empower girls who never imagined their place at a summer robotics camp in middle school, an advanced placement computer science class in high school, or an engineering major in college. We work with girls in Oakland, Seattle, and Washington, DC, introducing them to the possibilities in STEM. In after-school and summer programs we teach skills, build confidence, and empower girls to imagine a future that helps make them part of the inner circle of STEM talent that drives tech innovations. When we began our work in the nineties there were few programs for girls and even fewer in after school with a focus on STEM. We are pleased to see how times have changed and how efforts have expanded to inspire the STEM talents of girls. The growth of new programs is positive and if we get this opportunity right we can change the face of STEM. Here are three effective and promising strategies for promoting diverse girls' opportunities in STEM. We need to do more to reach a wider range of girls. The number of girls who say they are very interested in a STEM career remains less than 25%. What about the other 75%? Girls' self-reported lack of interest is often due to lack of exposure to STEM. Girls from different communities experience vastly different access to STEM-related activities both in and out of school. And, we know that many girls do not have role models who can provide first-hand exposure to STEM careers or the kind of guidance needed to support them on an academic and career path to becoming a bioengineer or CEO of a tech startup. The secret sauce for expanding our recruiting practices has to include family engagement. Families are girls' most trusted resources and role models; family engagement and partnership is critical to opening STEM doors for girls. To be successful in engaging all families, programs need to meet girls and their parents where they feel comfortable. Girl Game Company hosts family dinner events, engages in regular phone contact with parents, gives take-home assignments that require parent input, invites families on field trips, and supports family liaisons who advocate for the importance of the program. Girls Who Code offers application support at local libraries and community centers. This allows girls and parents to seek help with completing applications and ask questions about the program. We are more likely to achieve what we measure. Set goals and commit resources to partner with families to recruit a wider range of girls, especially those who have potential but not yet the opportunities to discover a passion and talent for STEM. This work takes time and needs to be baked into programs and budgets. It won't be easy, but is the only way to truly make STEM accessible and programs equitable. In order to serve more girls, and especially more diverse girls we need to be explicit that our users are girls who are racially diverse and from under-resourced and under-recruited communities. And, we must recognize that not all girls are alike, nor are all girls of color alike. Girls' experiences are shaped not only by gender, but also by race, socioeconomic status, home language, and the broader cultural context in which they live. We need to deeply understand these diverse groups of girls from diverse cultures and work with them to customize solutions for them. Designing these solutions will be challenging; fortunately, we have model programs to turn to for practices that are bold, girl-centric, and culturally-responsive. Girlstart understands that it can't successfully support all girls and carefully defines which girls to serve. It then works with liaisons to identify and recruit girls who are "the right fit." For Girlstart, this means finding girls who are not already interested and confident in STEM. CompuGirls makes STEM real and culturally relevant to the everyday experiences of girls. Working in small groups, girls use technology to work on issues of social injustice and utilize multimedia to suggest potential solutions. The CompuGirls experience proves to girls that even if they are 14 or 15, they have the means to make global change. It is particularly important as we scale that we keep in mind that there is no one-size-fits-all approach to inspiring girls in STEM. We need to allow, and in fact, encourage staff to customize programs and methods for the girls and communities they serve. Once we bring girls in to STEM programs we need to be certain that we've created safe spaces for them to explore and find their place in STEM. Observing, hypothesizing, asking questions, and testing designs are skills needed for success in STEM. Girls need environments where it's safe to hone these skills. This is especially important for girls new to STEM, for girls who lack self-confidence, and for girls who feel different because of their racial/ethnic or socioeconomic status. Techbridge creates supportive group norms that honor multiple perspectives and encourages participation in a design process that includes prototyping, testing, and redesign. Girls and staff celebrate "glorious goofs" and write and talk about challenges, which help them step back from feeling frustrated and step into a space of reflection toward reimagining new solutions. How do we know if a space feels safe and empowers girls? Create opportunities to tap into girls' reactions on a regular basis through observations, interviews, focus groups, reflections, and embedded assessments. GET City students record video diaries 1-2 times a month to give feedback to teachers. This built-in feedback system helps to ensure students' opinions and insights are valued and addressed in a timely fashion. Making the physical and social space of programs safe isn't a nice-to-have element, but essential to supporting girls who have the most to gain from STEM programs. It takes time to build and sustain trusted learning environments for diverse communities. We need to listen to the voices from the communities we serve. By involving members of the community--girls, families, staff, and community partners--in developing and implementing programs we will build better programs. Let's change the game for girls in STEM. We hope our recommendations will help those who are on the ground doing the work and those who are funding efforts to bring to scale programs that support girls in STEM. We need to step up our efforts and offer opportunities on a grand scale. We need to commit to the girls with less expressed interest in STEM and fewer STEM-related opportunities and access to STEM. These girls can bring new perspectives and fresh talents to diversify STEM. You can learn more about the strategies described in this blog in Change the Game for Girls in STEM: Findings in High Impact Programs and System-Building Strategies, a white paper on best practices and learnings from leaders in the field. We thank Chevron for recognizing the talents of girls and supporting our work on this white paper. 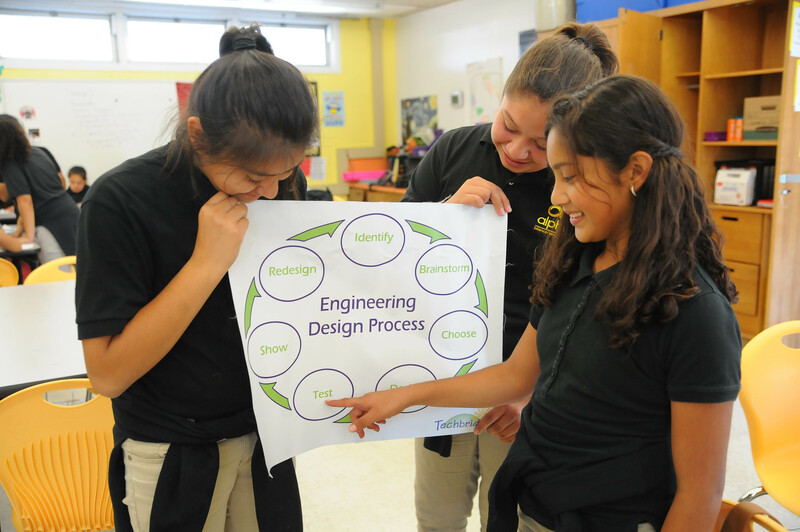 We'd like to hear from you and how you are making STEM accessible to girls in your community.